In September 2016, a longtime GOP operative launched a campaign to obtain Hillary Clinton’s emails from hackers. The operative’s name was Peter W. Smith. According to a pair of blockbuster articles (here and here) by The Wall Street Journal, Smith “implied” that he had a connection to retired Gen. Michael Flynn, who served briefly as Trump’s national security advisor until he was ousted for lying about his contacts with Russian officials. A name people might not recognize on this list is that of Sam Clovis, a porcine former college professor from Iowa better known as host of the radio talk show “Impact with Sam Clovis.” We don’t know how Clovis’ name wound up on the list but I have a feeling we may hearing more about Clovis in coming weeks or months. 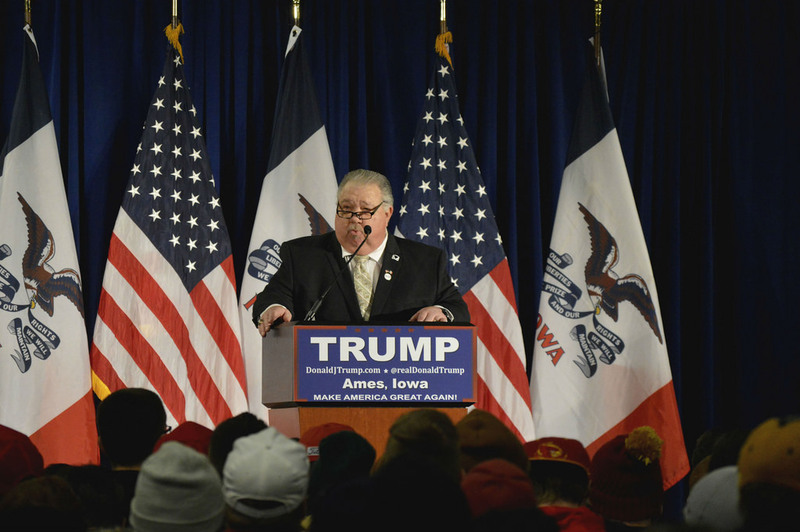 Clovis was an early backer of Trump in Iowa, where Clovis is something of a conservative power broker. It earned him a spot in the campaign as senior policy adviser and co-chairman. Trump finished second in Iowa, but he soon ran the table in ensuing primaries, and, as the Trump train gathered momentum, Clovis took leave from his position as a professor at Morningside College in Sioux City, Iowa to devote himself to the campaign. FEC records show he was paid more than $198,000 during the 16 months he worked on the Trump campaign. Clovis told Bloomberg he led a two-person policy team that worked with campaign manager Corey Lewandowski to connect Trump to experts and former officials constantly. In other words, Clovis was something of a gatekeeper for Trump. If you wanted to work on the campaign in a policy role or as a subject matter expert you went through Clovis. “This whole notion that he is devoid of advisers is wrong. We have a lot of smart guys around us and a lot of smart people helping us,” Clovis said in January 2016. One of the “smart people” whose name crossed Clovis’ desk was Carter Page, the head of an energy investment firm and a former banker with Merrill Lynch in Moscow. Clovis employed what The Washington Post described as the campaign’s “go-to vetting process” — a quick Google search — to check him out. Clovis gave Page his OK. Page, we know now, was a disastrous choice. During his time as a Trump advisor, Page was the subject of a Foreign Intelligence Surveillance Act warrant, meaning that a US judge found probable cause to suspect that Page was acting as an agent of a foreign power. He reportedly was one of the Trump advisors Russian intelligence tried to use to infiltrate the Trump campaign. Foreign diplomats trying to figure out Trump also realized that Clovis was the man to see. He was one of the few Trump campaign officials authorized to speak on behalf of his boss. Joe Hockey, Australia’s ambassador to the United States, was one who called on Clovis. Hockey hosted Clovis and Stephen Miller, in March 2016 at his private residence. (See “Deep ties to keep relations on track,” The Australian, 11 Nov. 2016) It was the first of several meetings on defense, trade and immigration. In April, German Foreign Minister Frank-Walter Steinmeier, who described Trump as a “hate preacher,” sent his state secretary, Markus Ederer, to meet with Clovis. The two men met discreetly at a cafe in Washington where Ederer struggled to understand what a Trump victory would mean for German-American relations. According to a report in Der Spiegel, “The Iowa Republican sought to ease the German’s concern about a possible Trump victory. But whenever Ederer probed deeper, Clovis was unable to provide satisfactory answers.” (See “Merkel Anticipates Frosty Relations with U.S.,” Spiegel, 4 January 2017) Clovis also met with Germany’s US ambassador, Peter Wittig, as did Jared Kushner. It remains to be seen what meetings, if any, Clovis had with Russian diplomats. Meanwhile, Clovis’ formerly hardline views on Russia were evolving. During his long career in the U.S. Air Force, Clovis had trained and planned for combat with the Soviet Union. In 2014, when Clovis ran unsuccessfully for the US Senate in Iowa, he advocated a “containment” policy against Russia. “I think we need to also make it very clear to Russia … that any incursions outside of Crimea, the Ukraine, would be met with great vigor,” Clovis told Radio Iowa. Two years later during the Republican convention in Cleveland, however, Clovis angrily defended the campaign’s decision to remove language from the GOP platform that called for providing lethal defensive weaponry to Ukraine. It was too expensive, Clovis felt. Although he doesn’t look the part, Samuel H. Clovis Jr. is a former fighter pilot. He grew up in rural Kansas and attended the U.S. Air Force Academy in Colorado. Clovis spent 25 years with the U.S. Air Force from 1971 to 1996. His career included command of the 70th Fighter Squadron, at Moody Air Force Base in Valdosta, Georgia. In the mid 1980s, he served on the staff of the Pentagon’s Project CHECKMATE, where he assessed the performance of the Air Force in a hypothetical war with the Soviet Union. Clovis also served as chief of the office of military cooperation at the embassy in Bahrain. (He considers himself an expert on the Middle East.) He retired as the Inspector General of NORAD and the United States Space Command with the rank of colonel. After leaving the military, Clovis worked at Logicon, an Alabama-based subsidiary of Northrop Grumman Corp. Then, he entered academia, which led him to Iowa and eventually to his position at Morningside College. But his feelings for Trump weren’t always so favorable. Before he joined forces with Trump in August 2015, Clovis had signed on as Iowa state chairman for former Texas Gov. Rick Perry. Emails leaked by the Perry campaign revealed Clovis as an opportunist who was scornful of Trump before switching sides. Trump’s remarks disparaging Sen. John McCain’s status as a war hero particularly galled Clovis, who served 25 years in the U.S. Air Force. “I was offended by a man who sought and gained four student deferments to avoid the draft and who has never served this nation a day — not a day — in any fashion or way,” he wrote. and you have made it the laughing-stock of the world. Thanks a lot Mr “President” ! !